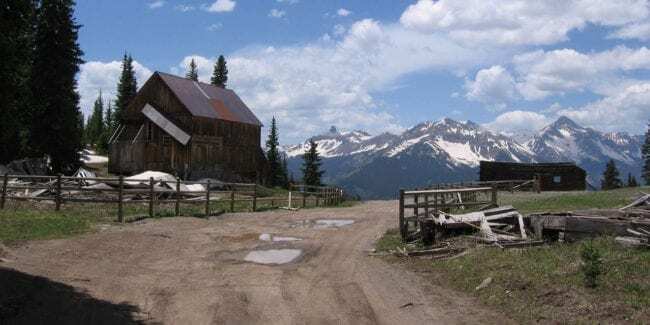 Situated between Telluride and Rico, Alta is a tiny ghost town with several original buildings still standing. The high elevation mining town was located at 11,800 feet. In its heyday a few hundred people lived here. The townsite was the center for the mining activity at the Alta-Gold King area from 1877-1948. During World War II the town came to life again briefly before the mill burned in 1948. The town was famous being the first place to use Tesla’s AC transmission system. Originally, the mines were powered by coal, which required a 4 miles day trip by pack mule to reach the mines. Construction of a powerplant and switching to electricity solved this. Take Alta Lakes Road six miles south of Telluride on Highway 145. Turn left and stay on hte road for 4 miles to reach the ghost town of Alta. To reach Alta Lakes, you’ll need a high-clearance 4×4, just follow signs from Alta.